Israel's acts in the Gaza Strip are reminiscent of the Nazis, United Arab List-Ta'al Chairman Ibrahim Sarsur said Monday, as Arab-Israeli politicians rushed to condemn Israel over the killing of a Gaza family earlier in the day. "Israel's killing of innocent people is reminiscent of some very dark times, including that of the Nazis," Knesset Member Sarsur told Ynet, and added that IDF operations in Gaza will eventually ruin the prospects for any possible advancement in the peace process. "While international forces from Egypt cooperate with Hamas and other Palestinian organizations that are doing their best to achieve calm and spare blood, Israel operates in a way that shows that it does not want calm in the region," he said. MK Ahmad Tibi (United Arab List-Ta'al) also had harsh words, saying "the Israeli public is impervious to the killing of citizens in Gaza, and this imperviousness allows the IDF to kill women and children. 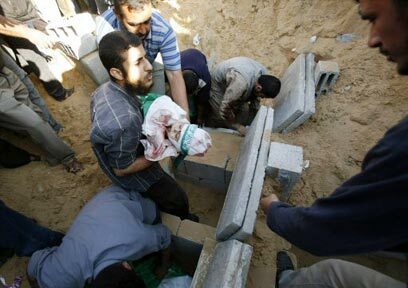 This slaying of children is a despicable war crime and an ethical failure on the part of the Israeli public." Meanwhile, in a statement issued by Ban Ki-moon, the UN Secretary-General condemned Israel "for the loss of civilian life in Gaza, including the tragic deaths of a mother and four of her children." He also called on Israel to "exercise maximum care and restraint," and reminded the IDF "of its responsibilities to protect civilians under international humanitarian law during its military operations." See all talkbacks "Arab MK: Israel's acts reminiscent of Nazis"